Chickens would ruin my window boxes. I like geraniums and without any outdoor space even one hen per box would spoil the carefully cultured look although being 20 feet off the ground at least the foxes wouldn’t get them. I’m saying this because I love an egg and after yesterday’s ‘sorry for myself’ mini-rant on supermarket packaging being pro-couple, the egg is surely the most ancient and perfect food for the solo diner. Of course everyone will tell you that fresh is best and this is undoubtedly true, hence my ruminations on slapping a couple of Burford Browns on the otherside of the roman blind. But I’ll regularly have a box of eggs for a couple of weeks and even on day 14, while poaching maybe a dangerous game an egg in cold water, brought to the boil and simmered for 4 mins isn’t half bad. Served with my favourite Rye & Spelt toast, unsalted butter and a sprinkling of Balinese sea salt from Big Tree Farms. I’m ready for the day. I like boiled eggs so much I invested £11 British pounds in this odd looking contraption. 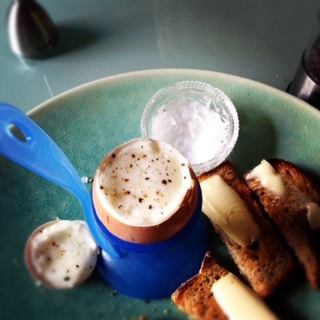 I’ve no idea if it’s the same thing Ollie Dabbous uses to make the perfect edge on his egg shells, but it’s fun to use. How it works, I’ve no idea. You draw the knob back, let it go and lo and behold a perfect edge on the egg. Well almost.